For many traveling to New York City, Memorial Day Weekend marks the unofficial start of summer in New York City and beyond, a three-day weekend filled with hot dogs, hamburgers, soda and beer. It’s the weekend that kicks off all the good times that will follow for the next three months. The idea is a nice one. We’ll be celebrating, too – when we’re not making sure you are enjoying a great hotel stay in Queens! But it’s important to remember that Memorial Day is not about celebrating the start of the summer months. No, this holiday weekend is about something much more important than that: Honoring the men and women who have given their lives in the Armed Forces. Memorial Day dates back to the days immediately following the Civil War, when it was originally called Decoration Day and was meant to honor those that fell in the War Between the States. This took place each May 30, chosen as the date when the most flowers would be in bloom. The Decoration Day ceremonies were always largest at Gettysburg, where in 1913, both Union and Confederate veterans came together for the 50th Anniversary of the Civil War. 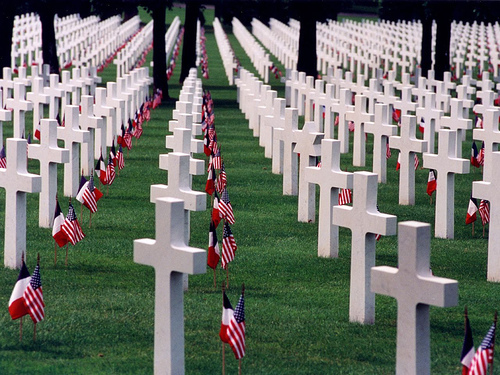 The name “Memorial Day” became common throughout the 20th Century, but was not officially recognized until 1967. Finally, in 1971, all 50 states agreed to make the holiday the final Monday in May. And that leads us here, to the day when we offer our thanks to those who fell in the line of duty. Their sacrifice cannot be overstated. It cannot be thanked too much. And so the entire staff here at the Holiday Inn Manhattan View in Long Island City says the only thing that needs to be said: Thank you.